Marriott Waters Thai uses their own specialised couriers to deliver their food. Sprinkled with sesame seed served with sweet chilli sauce. Minced chicken and prawns wth water, chestnuts, onion, carrot, Thai herbs and spices with special homemade soy sauce. Short crust pastry with chicken mince, vegetable and potato filling or vegetarian with sweet chilli sauce. Made daily from the freshest ingredients with sweet chilli sauce. Fried with a rice batter coated with shredded coconut with sweet chilli sauce. Marinated in lemongrass, salt and pepper with homemade chilli sauce. Marinated in coconut milk and grilled with spices and with peanut sauce. Crispy pork belly served with tamarind chilli sauce. 2 x Satay Chicken, 2 x Spring Rolls, 1 x Curry Puff, 2 x Fish Cakes and 1 x Chicken Wings. Served with sweet chilli and peanut sauces. Red curry with coconut milk, vegetables and Thai basil. Green curry with coconut milk, vegetables and Thai basil. 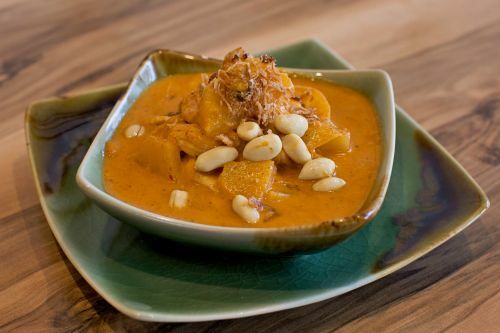 Yellow curry slow cooked with coconut milk, potato, onion and pineapple topped with crunchy peanuts. Slow cooked with coconut milk and kaffir lime leaves. Vegetables and cashews with Thai herbs and spices. Fresh ginger with vegetables, Thai herbs and spices. Sweet and sour with tomato, onion, pineapple, Thai herbs and spices. Fresh garlic with ground black pepper and vegetables. Red curry sauce with chilli paste, vegetables, Thai herbs and spices. Crispy pork with Chinese kale, carrot, onion and garlic. Peanut sauce with vegetables, Thai herbs and spices. Thai basil and vegetables with chilli and herb sauce. Mixed seafood with green pepper, vegetables, Thai herbs and spice. Prawns in red curry sauce with Thai basil, vegetables, Thai herbs and spices. Whole barramundi fried with special chilli sauce. Flat rice noodles with spring onion, bean sprouts, egg, crushed peanuts and tamarind sauce. Flat rice noodles with vegetables and egg. Thai fried rice with tom yum sauce and vegetables. Thai fried rice with green curry, vegetables and Thai basil. Northern Thailand spicy salad with green papaya, tomato, lime juice, Thai herbs and spices. Warm rare beef salad with lime juice, cucumber, tomatoes, Thai herbs and spices. Marinated then BBQ'd beef or pork tossed with Thai herbs and spices and toasted rice powder. Roasted duck fillets with Thai herbs, spices and toasted rice powder. Warm salad of fish fillet, prawns and calamari tossed with Thai herbs and spices. Tangy soup seasoned with lime juice, lemongrass, mushroom and tomato. Sweet and sour soup with mushroom, tomato, lemongrass and galangal in coconut milk. Served with ice cream, maple and a palm sugar syrup.